RICHARD C. SCHEINBERG received his undergraduate degree in psychology and sociology in 1975 from the State University of New York at New Paltz and his master’s degree in social work in 1981 from Adelphi University in Garden City, New York. He is currently a licensed clinical social worker in the state of New York and a Board Certified Diplomate in clinical social work by the American Board of Examiners in Clinical Social Work. Scheinberg served as an executive board member of the Suffolk County chapter of the Society of Clinical Social Work from 1984 to 1995. Because of his work with graduate students in the 1990s, Scheinberg was recognized as an Adjunct Assistant Professor at the New York University School of Social Work in January 2000. Mr. Scheinberg, a psychotherapist with 32 years in private practice helping children, adults, couples, and families, is the director of Sunrise Counseling Center in East Islip, Long Island, New York. Founded by Mr. Scheinberg in 1993, the Center now has a staff of 48 clinical practitioners serving 2000 people each month. Aside from being a human resources specialist for community organizations, employee assistance programs, and managed care insurance companies, Mr. Scheinberg continues to serve as a seminar and workshop leader locally and as a business consultant outside of New York State. He has been featured locally both in print media and on television. As Mr. Scheinberg has evolved spiritually, he has chosen to devote more time and energy to professional development that is directly associated with what one may call “the life force”. This research has included a wide range of training involving mystical and energy practices that relate to life, love, karma, and overall mind-body health. These experiences include ancient and modern forms of meditation, prayer, hypnotism, chakra clearing, psychic development, angel communication, mediumship, remote viewing, and alternative healing modalities (Reiki and Reconnective healing). One of his most important retreat experiences to enhance his clinical repertoire of skills came in the form of training and certification in hypnosis for past life regression from the Dr. Brian Weiss Institute. Mr. Scheinberg is a member of the National Association of Social Workers, the American Board of Examiners in Clinical Social Work, the International Association for Research Regression & Therapies, and Edgar Cayce’s Association for Research and Enlightenment. Mr. Scheinberg currently resides in Islip, New York with his wife of 35 years, Geraldine. They have one son, Jared, who is thirty years old. Please enter your name and email address below and I will give you a link to download my popular Top 10 List of Couple Communication Skills (reprinted from Chapter 6). 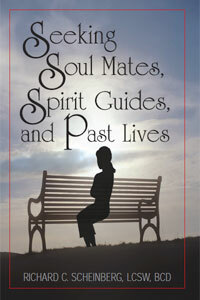 I will also keep you informed about upcoming events, lectures, workshops and the highly anticipated release of Richard’s new book, Seeking Soulmates, Spirit Guides and Past Lives.